Today’s image is the first trip to Exeter in a very long time here at The Daily Portsmouth. I have been hoping to get the creative juices flowing again, and shooting out in a new location seemed to do the trick. Another gorgeous historic seacoast town…Exeter has a very photogenic downtown with a traditional mainstreet New England feel. This building is perched just over the river that runs through Exeter (and ultimately reaches Great Bay to the north). As you know by now – I tend to shoot wide open spaces and try to convey a sense of space with a majority of my shots. 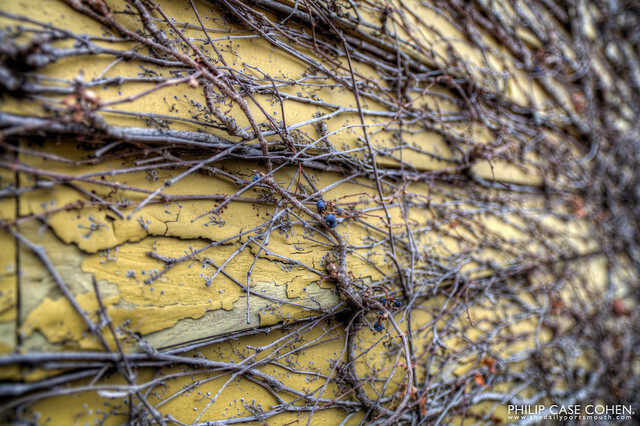 When I saw the awesome growth on the side of this building, I wanted to create that same spacious feeling while getting the gritty detail of the vines and the dried berries still clinging to their nurturer despite the freezing temperatures.